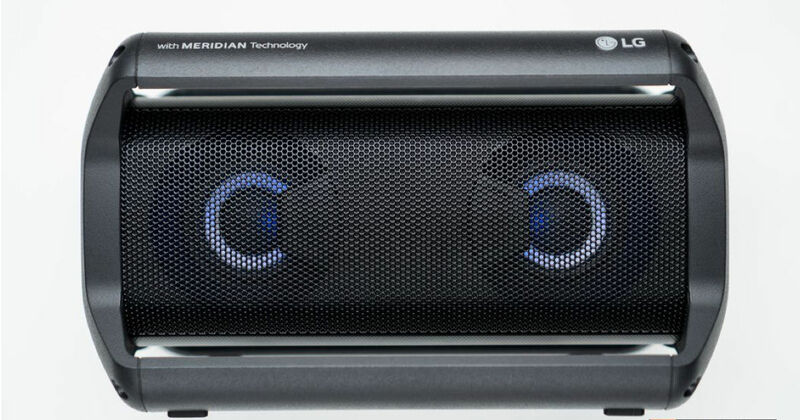 There’s no shortage of Bluetooth speakers in the market, which is both, a boon and a bane. On one hand, people can choose from a plethora of options from various manufacturers but on the other, it just makes making the buying decision that much more difficult. 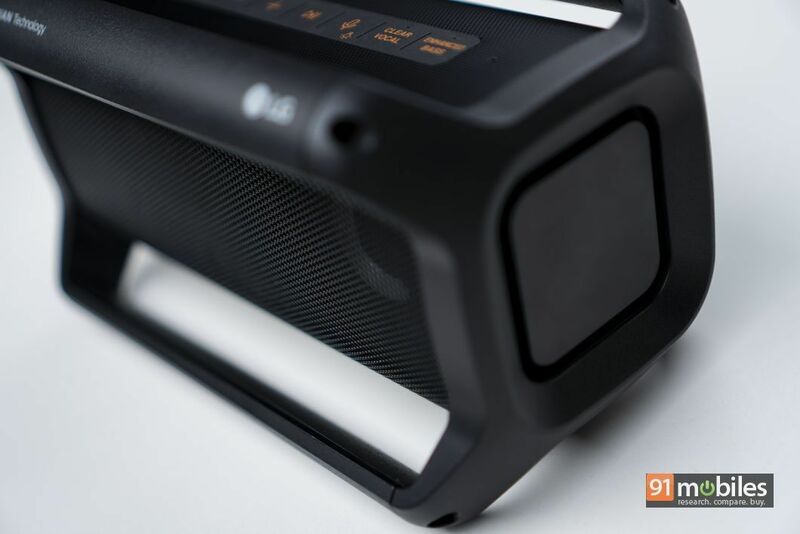 Adding to the pile of products, LG recently announced its XBoom Go PK5 Bluetooth speaker in India which boasts impressive acoustics and a weather-proof design. So then, should this be your next ‘go anywhere’ Bluetooth speaker or can you safely skip the XBoom Go PK5? Let’s find out in this review, shall we? Let me say this right off the bat – I’m not a fan of the XBoom Go PK5’s design. Having recently reviewed the Boom 3 Bluetooth speaker from Ultimate Ears, I feel that the design of the XBoom PK5 is rather impractical. Now, I do like how the speaker looks and from a pure aesthetics standpoint, it appears quite nice. However, I take issue with the speaker’s portability. 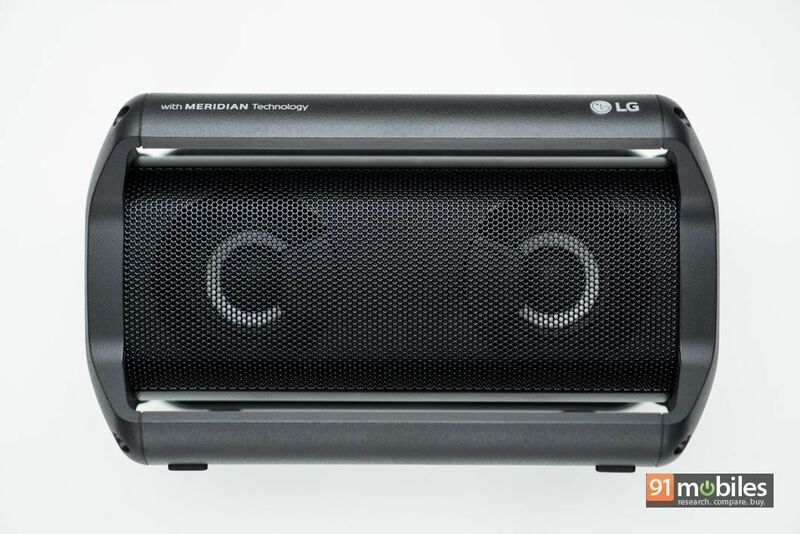 LG markets the XBoom Go PK5 as a speaker you could use to listen to music anywhere, at any time. 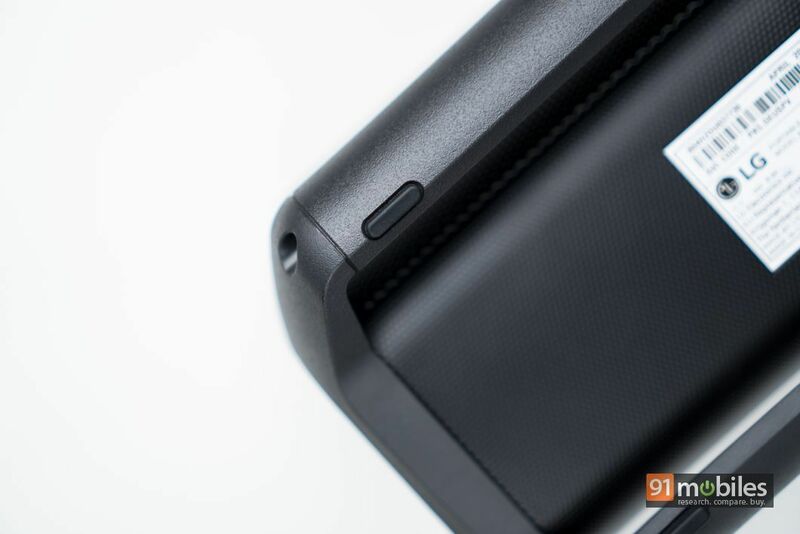 But, the unit’s cuboidal shape, coupled with LG’s X-grip handle makes it a chore to fit in a bag. 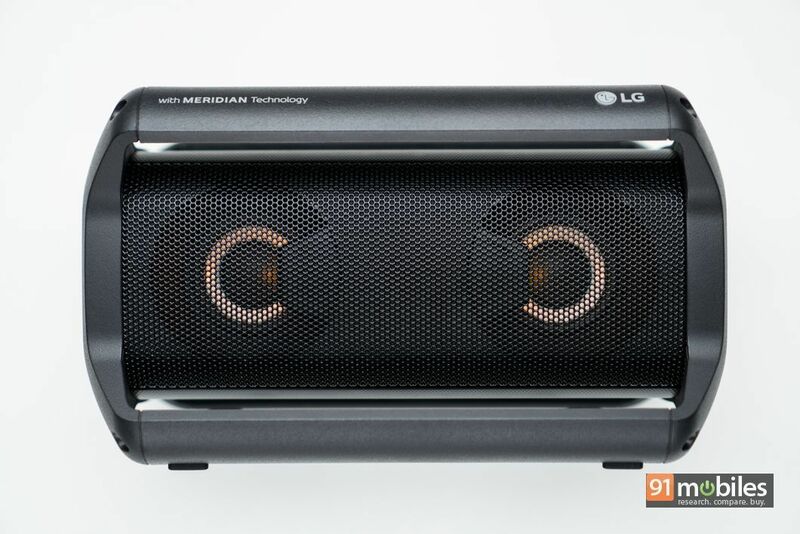 And, I’m confident you’ll not want to carry the speaker in your hand as LG has showcased in some of the product shots at all times. What’s more, while the actual speaker unit feels quite robust, the X-grip handle has some flex to it, and it feels a bit flimsy. Now, I didn’t stress test the handle to see if it would snap, but rest assured, it didn’t instil a lot of confidence in me in the first place. And then, there’s the speaker’s IPX5 splash-proof certification which is great until you look online to find cheaper alternatives with a superior ingress rating than the XBoom Go PK5. With that said, I am all for RGB lighting and with the XBoom Go PK5, you’ll be able to feast your eyes to a set of LEDs which circle the speaker’s drivers, akin to Sony’s SRS-XB41. The LED lighting pulses with the beats of your favourite songs and looks awesome in a dimly lit room. LG even lets you control the colour and tweak the pulsating speed of the lights from within the speaker’s companion app. 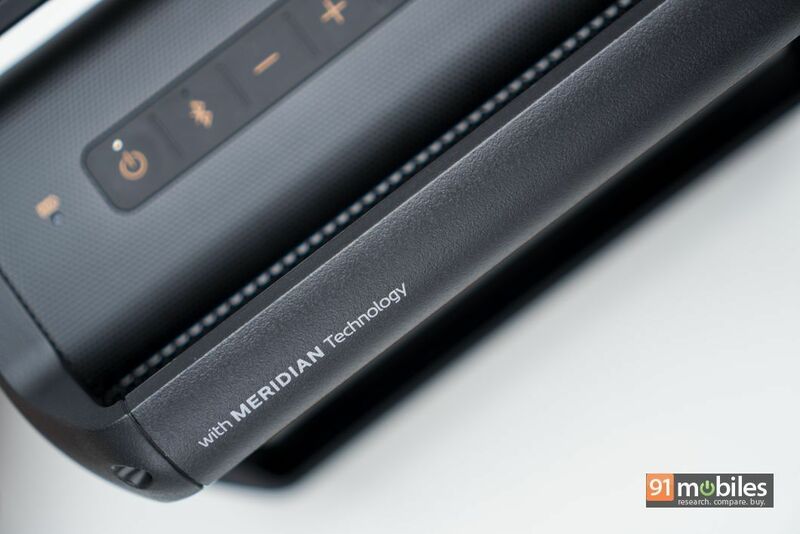 As far as the controls are concerned, you’ll find a total of eight buttons towards the top of the speaker which include controls for music playback, Bluetooth pairing as well as buttons to change the EQ of the speaker. There’s a dedicated button to invoke Google Assistant or Siri on your smartphone too, but I didn’t find much use for it during my testing. You see, rather than pressing the button on the speaker, I could just long-press the home button on my phone to invoke the Google Assistant and get the same result. 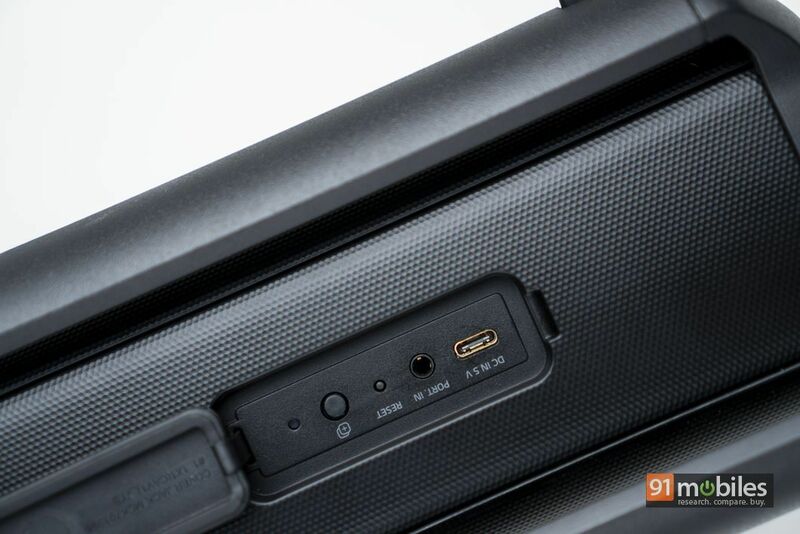 The ports are hidden towards the back of the speaker under a flap, opening which you’ll find a USB Type-C port for charging, an AUX-in port, a button to reset the speaker to its default settings and another one to daisy-chain the XBoom Go to another unit. I’m glad that LG is adhering to the latest charging standards instead of shipping the XBoom Go with a micro-USB port. 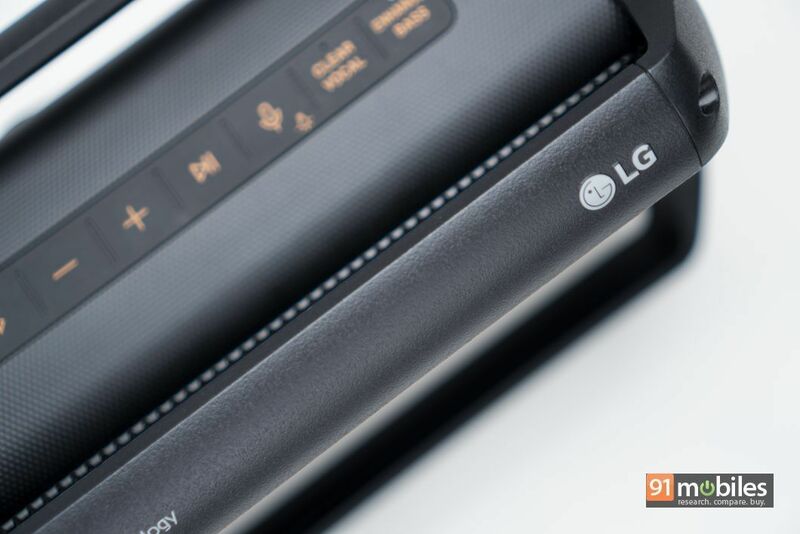 The LG XBoom Go PK5 sounds great, provided you’re selective with the tracks you throw at it. The speaker undoubtedly favours the low-end, which makes it an excellent choice if you like listening to songs from the EDM, Hip-hop or Pop genre. I tested the unit with Post Malone’s Wow and Ariana Grande’s 7 Rings, and the passive radiators on the XBoom Go PK5 didn’t disappoint me. The beats had a solid punch, didn’t sound bloated and the decay between subsequent beats was kept to the minimum too, thereby ensuring that the bass didn’t come across as boomy or hollow. As good as the speaker’s low-end output is, it’s still not on par with what you’d get from say, the Sony SRS-XB41. I was hoping that turning on the ‘enhanced bass’ preset would address my woes but much to my dismay, there was no perceivable difference in the audio output. In a similar fashion, while the mid-range sounded brilliant coming out of the speaker, turning on the ‘clear vocals’ preset didn’t little to put emphasis on the singer’s voice. Regardless, I thoroughly enjoyed listening to Hozier sing his soul out in his recent single, Movement. I would like to point out that owing to the speaker’s bass-heavy sound signature, you’ll notice instruments like kick drums steal the spotlight from other frequencies. A good example of the same is during the chorus in Movement, wherein, Hozier’s voice is shadowed by the intensity of the beats. As I mentioned at the beginning, the LG XBoom Go PK5 sounds brilliant for the most part and only falters when you play songs from the rock genre on it. To cut a long story short, there’s noticeable muddiness in chaotic rock tracks which was immediately evident when I played A Perfect Circle’s So Long, and Thanks For All the Fish. While the song played well at the start, I couldn’t make out any details in the track once the band introduced riffs from the electric guitar. Therefore, if you were looking to bang your head to the Killers, the XBoom Go is not for you. Finally, let’s talk about the XBoom Go’s soundstage, which is wide enough for a speaker its size. Now, unlike the Boom 3 I reviewed recently, the XBoom Go spits audio in just one direction and consequently, you’ll find the soundstage to be a bit restrictive. However, daisy-chaining the speaker to another unit can increase the spaciousness of the soundstage dramatically. The LG XBoom Go PK5 lasts very, very long. The company claims that the speaker can play music for 17 hours off a single charge, which is phenomenal. While I didn’t have the opportunity to play music for that long in one go, the speaker breezed through the eight-hour mark with plenty of juice still in the tank. Suffice it to say, you won’t have to worry about the speaker running on fumes a few hours into a party. 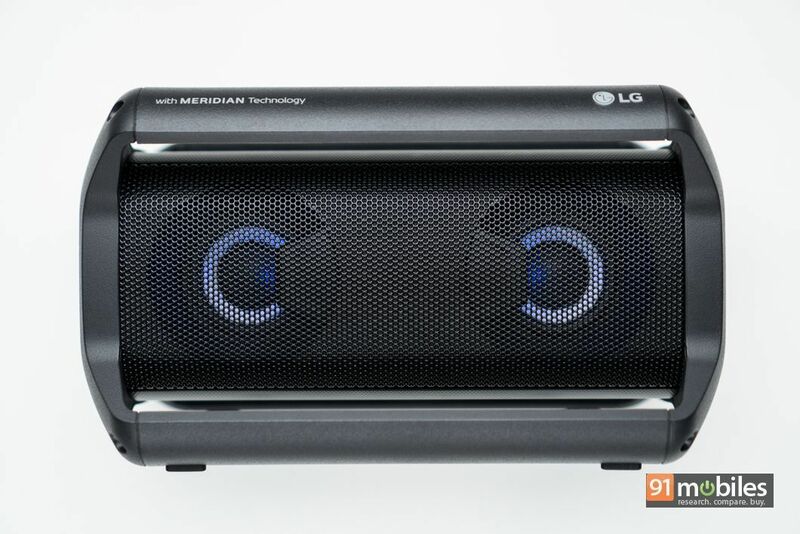 So, is the LG XBoom Go PK5 worth your bucks? Well, the answer to that isn’t as black and white as I’d like it to be. You see, the sticker price for the speaker is 15,000, which pits the unit against the UE Boom 3 (review) and the Sony SRS-XB41 (review), both of which are more robust and sound better. 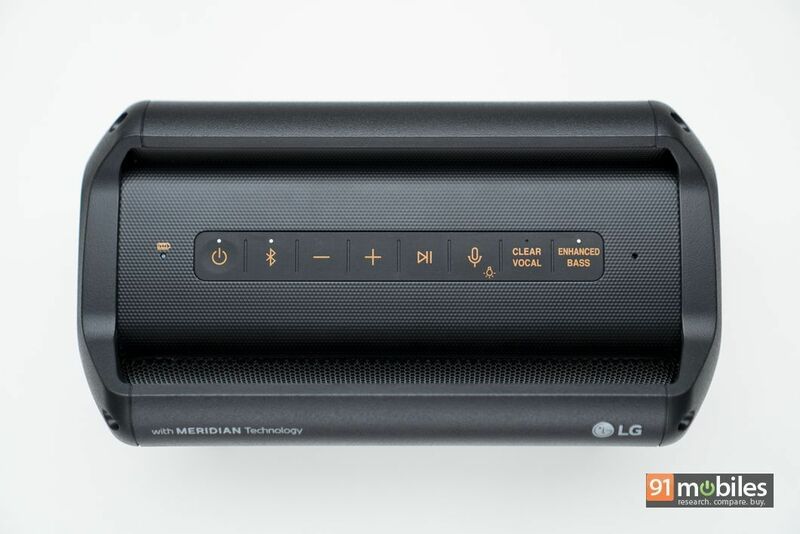 However, a cursory look online will show you the LG XBoom Go PK5 listed for prices as low as Rs 10K. At that price point, the speaker isn’t a bad option. So if you can find the speaker retailing close to Rs 10K, then, by all means, grab one. Else, give this one a pass.